Scans of 3 Wilson letters and a photograph of Jessie Wilson courtesy of Goucher College Archives. The photograph and letters are arranged chronologically in four separate folders. A final fifth folder contains transcripts of the letters. Two of Wilson’s daughters, Jessie and Margaret, attended Goucher College. The first 1913 letter from Wilson to The Friends of Goucher College urges them to recognize the importance of women’s higher education and the need for adequate funds to support the college. The second 1918 letter from Wilson to the president of the college, William Westly Guth (president 1913-1929) is regarding the College Trustees’ treatment of Doctor Hans Froelicher fueled by suspicion that the professor’s German heritage would contribute to disloyalty. The third letter, written by John Randolph Bolling on Wilson's behalf, responds to a request from President Guth, declining to comment on Goucher College's separation from the control of the Methodist Church in 1922. The collection also includes a scanned photograph of Jessie Wilson from 1912. 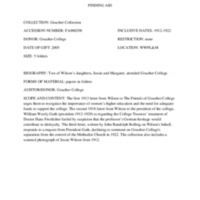 Diduch, Emma, “Goucher College Collection Finding Aid,” 1912-1922, FA000298, Goucher College Collection, Woodrow Wilson Presidential Library & Museum, Staunton, Virginia.